Are you a candidate for a facelift? If your face or neck has begun to sag but you have strong well-defined bone structure and still have some elasticity in your skin, a facelift can set the clock back on your appearance. Excess fat is removed, the underlying facial muscles are tightened, and the skin of your face and neck is repositioned. The age of most facelift patients is between 40 and 60, but facelifts can be done successfully on older people as well. A facelift is a very individualized procedure. In your initial consultation the surgeon will evaluate your face, including the skin and underlying bone, and discuss your goals for the surgery. While this procedure may give you a younger appearance and enhance your self-image, it cannot restore your youth or give you a completely different look. It may take several hours for this procedure, and longer if you are having multiple procedures. More extensive procedures may even require multiple surgeries. The methods of surgery used in a facelift vary on the preference of your surgeon. While some prefer to work on one side of the face at a time, others may alternate sides. The location of incisions and order in which they are made depends on the structure of your face and the techniques your surgeon has been trained in. Local anesthesia is the standard for most facelifts, combined with a sedative. Your face will be insensitive to pain, although you may feel some tugging or discomfort. If your surgeon prefers to use general anesthesia, you will be asleep during the operation. Once the incisions are made, fat can be suctioned and removed from the lower area of the face to improve facial contour. The muscles underneath are tightened and the skin is pulled back and trimmed before the incisions are stitched back up. You may want to grow your hair out to cover the scars while they heal around your hairline. A small tube may be placed behind the ears to drain any blood or fluid that can collect there. Complications with a facelift can include hematoma, nerve damage to the facial muscles, infection, and a reaction to the anesthesia. If you are a smoker, you can expect your skin to heal very slowly. Factors which can cause problems during or after surgery include high blood pressure, difficulty in blood clotting, or excessive scarring. After your facelift, you will not be in intolerable discomfort. Some pain is expected and can be alleviated with pain medications. If your face is numb, it should disappear in a few weeks. You may need to keep your head elevated and as still as possible for a couple of days after surgery, to minimize swelling. Any drainage tubes that have been inserted should be removed in the office within one or two days. You may be shocked or surprised by the puffy and bruised face that you see, but remember that you will look better than ever in just a few weeks. You might have to take it easy for a few weeks but you should be able to go back to regular activities after a week of rest. Some scarring is possible, but if done well, they're hidden by your hair or in the natural creases of your face and ears. In time they will fade and not be noticeable. 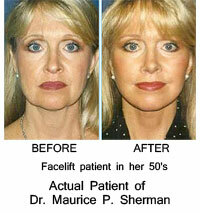 It is possible to have more than once facelift in a lifetime. If you find yourself unhappy with your face again in five or ten years, you can repeat the procedure. Are new technologies creating the need for Facetime Facelifts?